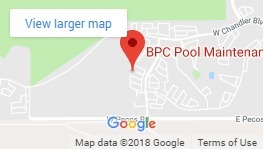 At BPC Pool Maintenance we hang our hats on the quality of our service we provide and the level of satisfaction that it delivers to our valued customers. We fully understand that our customers are what keep us in business and customer satisfaction is paramount in BPC remaining a leader in Ahwatukee pool care and maintenance. We employ quality, thoroughly trained technicians who provide top of the line Pool Maintenance and weekly service. We are a leading and trusted pool care provider and we look forward to the opportunity to show you why!